Everybody told me that having two kids only 15 months apart would be a challenge. I guess this time "everybody" was right because I most definitely have my hands full during the day! However, there is one tool in my parenting arsenal that has made life much easier over the past few weeks: blanket time. When Rooster was 11 months old we started implementing blanket time in our home. It has proved to be one of the best parenting decisions we ever made! Blanket time is a set aside, structured play time. We spread a blanket on the floor and Rooster is expected to play contentedly with one or two toys for a set amount of time without getting off the blanket. The amount of time varies from day-to-day. When we began a few months ago, 5 mins was a stretch for us; however, after lots of practice we can usually get a good 20 mins of play and another 10 mins of semi-distracted fussing before everybody loses it! Those are precious 20-30 minutes for a mom who really needs to sit and nurse a baby without having to get up and discipline a toddler who has pulled all the books off the shelf or dumped his basket of clean diapers in the toilet. 1. Pick a fair-sized blanket and a good "thinking" toy. Our blanket is 3 feet square which worked great in the beginning; however, as he grows we might need to get a bigger blanket! I prefer toys that enhance fine motor or reasoning skills. Toys that provide some sort of challenge tend to keep Rooster occupied longer. 2. Spread the blanket on the floor with the toys and set a timer. We chose 5 minutes as a start time and worked our way up by increasing the time each week by 2-3 minutes. The timer helps the child associate the end of blanket time with something other than fussing and crying. It also helps mom and dad keep their resolves to see it through to the end...even when there are major meltdowns involved. 3. Plop your little one on the floor and instruct them to "stay on the blanket". Now, in the beginning Rooster obviously had no idea what "stay on the blanket" meant, but each time he got up to leave we would calmly and firmly put him back and say "stay on the blanket". Of course, after a few rounds of this he would cry and whine and throw a fit, but after a few weeks (I'm not going to lie...it was a long process!) he finally realized that playing on the blanket was more fun than crying on the blanket. 4. Stick with it. I always knew that if we were consistent Rooster would get used to the idea of blanket time, but I never dreamed he would come to LOVE IT! Seriously, kids love boundaries. Now when I say it's blanket time, Rooster runs to his blanket to see what fun thing he gets to play with! Makes my heart happy. Of course, blanket time isn't always fun and games. We still have rough days where it seems like I spend more time correcting him than getting anything done, but those days are getting fewer and far between. For the most part, blanket time has become a well-loved routine around our house. One for which this tired mom is very, very thankful! So what about you? Do you do blanket time or something similar in your home? 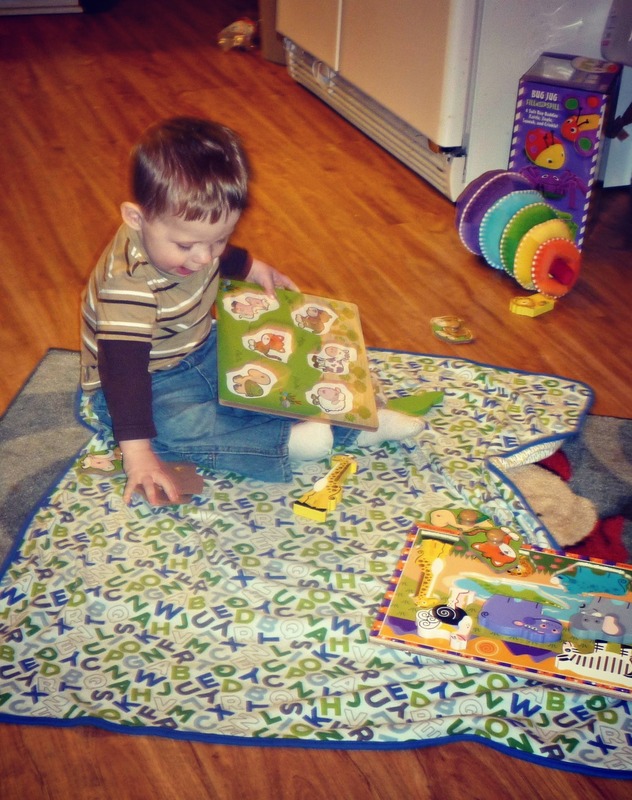 How do you structure play time for your toddlers? I did blanket time with my two oldest as well. It was so helpful! It also makes it easier to take them places if you need them to play quietly without wandering off. We don't do a specific blanket time, but we have a rug in our living room that I will often put a blanket on and then pull out an educational toy that requires more thought for my 18 month little girl. She will play and play with it if I am sitting near her, even if I am doing something else. My girls are 16 months apart and I love reading about your family since ours is similar (at least with the kids' ages). I always forgot to do blanket time, but I will have to remember it with the little boy I baby sit! Amazing! I don't do blanket time because my oldest is only 9 months old! I will be implementing it in soon, thanks to you! It's genius! I would have done it when my children were little (if we had had a blanket) but I never ever heard of it. What a brilliant idea!! Children need to learn discipline. We need them to have it sometimes when we are out but that is not the time to teach them something. My children sat through church from infants but we taught them at home and not in church. I read this post with raptured interest even though my youngest is 18. I suppose it is too late for him?? Ohh, blanket time sounds fantastic. My little girl is almost 11 months, perhaps I need to start it. She is into everything already and it is exhausting. I have been dreading when she learns to climb out if her pen. Sigh. I've seen this done. It is something I really want to start doing with mine, I just have to find the time to start. Great idea though! Thanks for linking up!